NOTE: Take care not to scratch the glove box. 2. While lifting the glove box handle (A), pull out one end of the retainer (B) with a hook-shaped tool of its slot. NOTE: Do not remove the retainer entirely. Leave one end of the retainer in its original position when removing the lock cylinder. 3. Remove the glove box lock cylinder (A). 4. 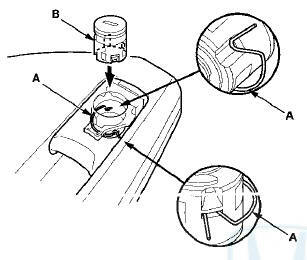 Reinstall the end of the retainer (A) in its slot, then reinstall the glove box lock cylinder (B). Push the cylinder into place securely until the retainer snaps into place.